Not to be confused with Global Compact for Migration. The United Nations Global Compact is a non-binding United Nations pact to encourage businesses worldwide to adopt sustainable and socially responsible policies, and to report on their implementation. The UN Global Compact is a principle-based framework for businesses, stating ten principles in the areas of human rights, labor, the environment and anti-corruption. Under the Global Compact, companies are brought together with UN agencies, labor groups and civil society. Cities can join the Global Compact through the Cities Programme. The UN Global Compact is the world's largest corporate sustainability (a.k.a. corporate social responsibility) initiative with 13000 corporate participants and other stakeholders over 170 countries with two objectives: "Mainstream the ten principles in business activities around the world" and "Catalyse actions in support of broader UN goals, such as the Millennium Development Goals (MDGs) and Sustainable Development Goals (SDGs)". Moving forward, the UN Global Compact and its signatories are deeply invested and enthusiastic about supporting work towards the SDGs. The UN Global Compact was announced by then UN Secretary-General Kofi Annan in an address to the World Economic Forum on 31 January 1999, and was officially launched at UN Headquarters in New York City on 26 July 2000. The Global Compact Office works on the basis of a mandate set out by the UN General Assembly as an organization that "promotes responsible business practices and UN values among the global business community and the UN System." The UN Global Compact is a founding member of the United Nations Sustainable Stock Exchanges (SSE) initiative along with the Principles for Responsible Investment (PRI), the United Nations Environment Programme Finance Initiative (UNEP-FI), and the United Nations Conference on Trade and Development (UNCTAD). The UN Global Compact was initially launched with nine Principles. On 24 June 2004, during the first Global Compact Leaders Summit, Kofi Annan announced the addition of the tenth principle against corruption in accordance with the United Nations Convention Against Corruption adopted in 2003. 2 Make sure that they are not complicit in human rights abuses. 6 The elimination of discrimination in respect of employment and occupation. 9 Encourage the development and diffusion of environmentally friendly technologies. 10 Businesses should work against corruption in all its forms, including extortion and bribery. The UN Global Compact is not a regulatory instrument, but rather a forum for discussion and a network for communication including governments, companies and labour organisations, whose actions it seeks to influence, and civil society organisations, representing its stakeholders. The UN Global Compact says that once companies declared their support for the principles "This does not mean that the Global Compact recognizes or certifies that these companies have fulfilled the Compact’s principles." Instead, as mentioned in a 2015 interview with Executive Director, Lise Kingo, "we are the guide dogs, not the watchdogs", with the organization seeking to prioritize providing resources and support instead of attempting to enforce discipline. The UN Global Compact's goals are intentionally flexible and vague, but it distinguishes the following channels through which it provides facilitation and encourages dialogue: policy dialogues, learning, local networks and projects. Given recent climate talks and summits, the UN Global Compact stands to play a critical role in helping signatories and governments work in part to achieve the SDGs. Recent studies indicate that businesses are more open than ever to private sector interventions, such as carbon pricing and other mechanics to help curb climate effects within the scope of business solutions. The Global Compact also will periodically create resources and guides that business and non profit organizations may use in their efforts to support the Compact's overall mission. One such example is the SDG Compass, developed in collaboration with the Global Reporting Initiative (GRI) and World Business Council for Sustainable Development (WBSCD), which is a collection of resources (analysis of the goals, indicators for businesses, tools for stakeholders) that companies can utilize in finding out their role in helping to achieve the SDGs. The first Global Compact Leaders Summit, chaired by the then Secretary-General Kofi Annan, was held in UN Headquarters in New York on 24 June 2004, to bring "intensified international focus and increased momentum" to the UN Global Compact. The second Global Compact Leaders Summit, chaired by Secretary-General Ban Ki-moon, was held on 5–6 July 2007 at the Palais des Nations in Geneva, Switzerland. It adopted the Geneva Declaration on corporate responsibility. Marking the 10th anniversary of the Global Compact's launch, the Global Compact Leaders Summit 2010 took place on 24–25 June 2010 in New York. On the occasion, the Blueprint for Corporate Sustainability Leadership  identifying leadership criteria linked to implementation of the ten principles, efforts to support development objectives, and engagement in the Global Compact was released. In 2009 Rotary International partnered with the UN Global Compact. This was a very friendly partnership since Rotary International played a role in the chartering of the United Nations. Since its creation in 2000 the Global Compact has been primarily focused on helping support and achieve the Millennium Development Goals, however, after those expired in 2015, their top priority has been updated to the pursuit and progress towards achieving the Sustainable Development Goals, and the SDG's accompanying 2030 deadlines. In 2001, the City of Melbourne proposed that cities as well as corporations should be allowed to join the UN Global Compact, arguing that this would provide a clear statement of a city's commitment to positive change, as well as motivating participation in international dialogue. The proposal was accepted, and the UN Global Compact - Cities Programme was launched in 2002. It was formed as an urban-focused component of the Global Compact with its International Secretariat initially located in Melbourne, Australia. The aim of the programme is to improve urban life in cities throughout the world. Melbourne became the first city to engage the Global Compact in June 2001. There are, as of 2016, over 130 member cities in the programme. In April 2003, under the directorship of David Teller, a framework called the Melbourne Model was developed that went beyond the Ten Principles. It begins by drawing the resources of government, business and civil society into a cross-sector partnership in order to develop a practical project that addresses a seemingly intractable urban issue. 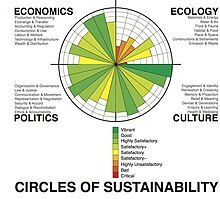 In 2007, the then Director, Paul James (2007–2014) and his colleagues Dr. Andy Scerri and Dr. Liam Magee, took this methodology further by integrating the partnership model with a four-domain sustainability framework called 'Circles of Sustainability'. In 2007, the Secretariat moved from the Committee For Melbourne to the Global Cities Institute at RMIT University, itself affiliated with UN-HABITAT. There, projects associated with city-based responses to global climate change and globalization became increasingly important. The Melbourne Model was further elaborated, with a sustainability indicators program developed as a way of assessing and monitoring progress. In 2012, the Circles of Sustainability method was elaborated to guide a city or urban region through a rigorous assessment process. As one of the outcomes it provides a figurative image of the overall sustainability of that city to illustrate its strengths and weaknesses. In 2015, RMIT Professor Ralph Horne became the third director of the UN Global Compact Cities Programme and in February 2016 an Urban Thinkers Campus was organised at RMIT Melbourne in collaboration with World Vision International as part of the buildup to UN Habitat III. The theme of the Urban Thinkers Campus was Ethical Cities: Locking in Liveability. This was followed by the organisation of an Urban Innovation Forum on Ethical Cities in July 2016 in Barcelona, Spain as a collaboration between the UN Global Compact - Cities Programme, RMIT Europe and UN-Habitat. The Global Compact Local Network in Australia was established in 2009 by a steering committee drawn from the Australian business community and stakeholder groups. It was formally incorporated in 2011. as the Global Compact Network Australia Limited, and elections were held for the inaugural board of directors. In 2011 it established two business-led leadership groups dealing with human rights and anti-corruption. The GCNA draws its funding directly from members and member-based activities, in contrast to many networks who rely in part on government funding. The Global Compact Local Network in Bulgaria was founded in January 2003, under the auspices of President Georgi Parvanov. The voluntary initiative unites 120 Bulgarian companies, non-governmental organizations and academia into a unique network. All members are united around the idea to apply the ten principles of the UN Global Compact in their daily practices and to be responsible corporate citizens.In 2006, to strengthen and enhance the role of the initiative, a management structure was introduced consisting of Advisory Board and a Secretariat. For the period 2006-2010 the network activities were supported by the United Nations Development Program Bulgaria. With the active participation and financial contribution of its members Global Compact Bulgaria organized numerous initiatives related to environment, health, education and youth. Among them are the projects: "Unleashing Entrepreneurship"; "Love Bridge"; "Sharing Best Practices in Corporate Social Responsibility". With the end of the support from UNDP Bulgaria, the Global Compact Local Network in Bulgaria had to identify and formulate a new strategy for sustainability. So, between 2009 and 2010 the members signed an institutional framework for future organizational development. As a result, on 10 September 2010 a new independent organization was founded – Association Global Compact Network Bulgaria. Its members are 20 leading companies and organizations in Bulgaria, members the UN Global Compact as well. The Association is managed by a steering committee and control committee. Their main goals are to learn from each other, to communicate, to generate an advocacy impact and initiate dialogue or partnerships with other actors such as the government, local authorities, labour organisations and civil society organizations. The Global Compact Network France was established in 2004. It is the second largest local network of the UN Global Compact after Spain, with more than 1,100 participants in 2017. The main aim of the Global Compact Network France is to add personalized value to the French participants of the Global Compact, in order to help them to make progress in their CSR approach and enlarge the Global Compact network. The local network is entirely financed by its members. The Global Compact Network (GCN) India was formed by organizations from India who participate in the Global Compact. It was registered on 24 November 2003, with Registrar of Societies, NCT, Delhi, as a non-profit body. The main objective of the Network is to provide a forum to various Indian Companies/ Organizations to exchange experiences, network and work together on activities related to CSR. This is expected to promote sustainable growth besides encouraging good corporate citizenship. The Network, acts as an Apex level nodal agency representing various Indian Corporate bodies/ Institutions/ NGOs/ SMEs, who are committed to the UN Global Compact principles. The Global Compact Network India has been one of the pioneering local initiatives of the Global Compact. It is one of the first local networks to be set up as a legal entity. Over the last nine years the network has seen modest growth and has been able to create a niche for itself within efforts by the business community directed towards realising the vision of sustainable development in India. At present Dinesh Kumar Sarraf, CMD, ONGC, is the President of the Global Compact Network India for the term 2015-17 and is managed by a Governing Council. The Syria initiative aims at enhancing civic engagement and corporate social responsibility of private sector by promoting the ten principles of the UN Global Compact as well as forging partnerships between private sector organizations, public sector institutions and civil society. This initiative is a partnership between the Syrian Government represented by the State Planning Commission and the UNDP Country Office in Syria. It was launched under the patronage of the Head of State Planning Commission and in the presence of the Deputy Chairperson of the UN Global Compact in July 2008. The Syrian Global Compact Local Network has 26 businesses, five NGOs, and five federations of commerce and industry. It was displayed among 10 selected ones from around the world in the Global Compact Sixth Annual Local Networks Forum. The Syria story was called a "leadership case" and the Syria Network growth ratio was ranked first among the global top ten in 2008. The UNGC National Advisory Council has been formulated and held its founders’ meeting on October 15, 2008, with the participation of leaders from the Syrian private sector, international corporate representatives, local and international civil society organizations, UNDP, the Syrian Government, media and education sectors. The Global Compact Network in Mexico in December 2014 endorsed the commitment of the private sector towards improving gender equality. Echoing the sentiments of initiatives such as the "HeforShe", and the large support of individuals in the region for promoting gender equality and empowering women. Much of this progress is being achieved by practical guidelines for how private entities can make a more diverse, inclusive workplace that create codes of global business. Some critics believe that without any effective monitoring and enforcement provisions, the Global Compact fails to hold corporations accountable. Moreover, these critics argue that companies could potentially misuse the Global Compact as a public relations instrument for "bluewash". Bluewashing refers to the alleged practice of companies claiming their membership or participation in philanthropic and charity based activity as an excuse, and perhaps as an entry door to increase corporate influence upon international organizations. An informal network previously known as Global Compact Critics leveled a variety of criticisms at the Global Compact, citing a lack of mechanisms for sanctioning non compliance or lack of progress. The Global Compact critics formally disbanded in February 2015, recommending that interested parties consult the Centre for Research on Multinational Corporations (SOMO) website. Similarly, the Alliance for a Corporate-Free UN, which also no longer exists, was a campaigning organization of several international NGOs, led by Corpwatch, which highlighted weaknesses in the principles underlying the Global Compact. The Global Compact was criticized by Maude Barlow, senior adviser on water issues to the President of the United Nations General Assembly in December 2008, accused the Global Compact of bluewashing. David Andrews, senior adviser on Food Policy and Sustainable Development, and Peter Utting, deputy director of UNRISD. Leaders of the tribe Ayoreo Indians in Paraguay wrote to the UN Global Compact saying they are "concerned and frustrated" by the inclusion in it of a controversial Brazilian ranching company. The company, Yaguarete Porá, was charged and fined for illegally clearing the Ayoreo's forests, and concealing evidence of uncontacted Ayoreo living there. The Ayoreo asked that it be expelled from the Global Compact. The Global Compact provides a list of its 12,000+ participant organizations, composed of roughly 8,000 businesses and 4,000 non-business entities on its website. The site provides a brief overview of each participant, and a link to their Letter of Commitment (if new), Financial Overview and Contributions (if applicable), and Communication on Progress (COP). Notable companies who have signed on the Global Compact include, but are not limited to, Starbucks, L'Oreal, Bayer AG, Coca-Cola, 3M, and Deloitte. In addition to its signatories, the Global compact has been repeatedly supported by the UN General Assembly, honoring its 15th anniversary in June 2015 alongside the Secretary General, Ban Ki-Moon, himself who claims that "Business can be a global force for good" and that "advocacy and example can drive action to achieve a life of dignity for all people". ^ "About the UN Global Compact - UN Global Compact". ^ "Major Companies to Help Set the Stage for Ambitious Climate Agreement in 2015". ^ "SECRETARY-GENERAL PROPOSES GLOBAL COMPACT ON HUMAN RIGHTS, LABOUR, ENVIRONMENT, IN ADDRESS TO WORLD ECONOMIC FORUM IN DAVOS - Meetings Coverage and Press Releases". ^ Dumalaon, Janelle (2015-10-14). "Global Compact: a guide dog, not a watchdog". dw.com. Retrieved 2016-01-26. ^ "Study shows UN climate change agreement needed to unlock funds for solutions to global warming". ^ "The UN Global Compact-Accenture CEO Study Special Edition: A Call to Climate Action - UN Global Compact". ^ Paul James and Andy Scerri, ‘Auditing Cities through Circles of Sustainability’, Mark Amen, Noah J. Toly, Patricia L. Carney and Klaus Segbers, eds, Cities and Global Governance, Ashgate, Farnham, 2011, pp. 111–36; Andy Scerri and Paul James, ‘Communities of Citizens and "Indicators" of Sustainability’, Community Development Journal, vol. 45, no. 2, 2010, pp. 219–36; Andy Scerri and Paul James, ‘Accounting for Sustainability: Combining Qualitative and Quantitative Research in Developing ‘Indicators’ of Sustainability’, International Journal of Social Research Methodology, vol. 13, no. 1, 2010, pp. 41–53. ^ Mylly, Tiina. "Work with a Local Network to Advance Peace". unglobalcompact.org. UN Global Compact. Retrieved 2016-01-26. ^ "Engage Locally- UN Global Compact". unglobalcompact.org. ^ "Global Compact Network Australia". United Nations Global Compact Network Australia. ^ "Leadership Groups - Global Compact Network Australia". ^ "Travel India". gcnindia.org. Retrieved 4 April 2018. ^ "Global Compact Network Mexico Endorses Private Sector's Commitment to Gender Equality". ^ "Pacto Mundial – Responsabilidad Social Empresarial – RSE – Sostenibilidad – Agenda y Objetivos de Desarrollo Sostenible – ODS – Derechos Humanos y Empresa". ^ Global Policy Forum Europe (ed. ), Whose partnership for whose development? Corporate accountability in the UN system beyond the Global Compact, speaking notes of a hearing at the United Nations, 4 July 2007. ^ Bruno. K. and Karliner. J., "Tangled Up In Blue: Corporate Partnerships at the United Nations", 2000. ^ Knight. G. and Smith. J., "The Global Compact and Its Critics: Activism, Power Relations, and Corporate Social Responsibility", in Discipline and Punishment in Global Politics: Illusions of Control, 2008. ^ Researcher, Somo (2015-02-27). "Global Compact Critics: Last blog post". Global Compact Critics. Retrieved 2015-12-07. ^ Global Compact Critics, "UN's new water advisor calls the Global Compact 'bluewashing'", December 10, 2008. ^ Global Compact Critics, "Global Compact’s real home should be at the General Assembly of the UN", April 7, 2009. ^ Peter Utting and Ann Zammit, "Beyond Pragmatism: Appraising UN-Business Partnerships", UNRISD, 2006. ^ "L'Oréal supports the United Nations Global Compact - L'Oréal Group". ^ AG, Bayer. "Bayer supports the UN Global Compact". ^ "United Nations Global Compact - Sustainability at 3M United States". ^ "UN Global Compact - Deloitte - Corporate responsibility and sustainability". ^ "Our Participants - UN Global Compact". ^ "'Business can be a global force for good,' Bans says as General Assembly honours UN Global Compact". Retrieved 2016-01-26. ^ "World of business must play part in achieving new Sustainable Development Goals – UN chief". United Nations Newswire. Retrieved 2019-01-26. Rasche, A. and Kell, G. (Eds.) (2010) The United Nations Global Compact: Achievement, Trends and Challenges. Cambridge/New York: Cambridge University Press. Kell, G. (2005) The Global Compact: Selected Experiences and Reflection, Journal of Business Ethics, 59: 69–79. Global Policy Forum Europe (Ed. 2007) Whose Partnership for whose development? : Corporate Accountability in the UN System beyond the Global Compact, Speaking Notes of a Hearing at the United Nations, Geneva, 4 July 2007. Debate between Georg Kell and Bart Slob (2008) UN Global Compact – Is the Compact raising corporate responsibility standards?, Ethical Corporation, May 2008.